Includes admission to the event. Seating is unreserved in tent and will be on a first come first served basis. Includes a guaranteed reserved seat and priority VIP entrance and VIP toilets. Includes 2 Mass (1.5 pint) of FestBeer, 1 glass of Schlumberger Sekt, VIP meal Calves Schnitzel w /salad and a digestive Underberg shot. In addition, there will be a welcome Brezel plate. Tables -just book the number of people you want we sit you together at a table. We offer corporate tickets with or without traditional cloth package on our Corporate Page. Seats will be filled starting from the front. 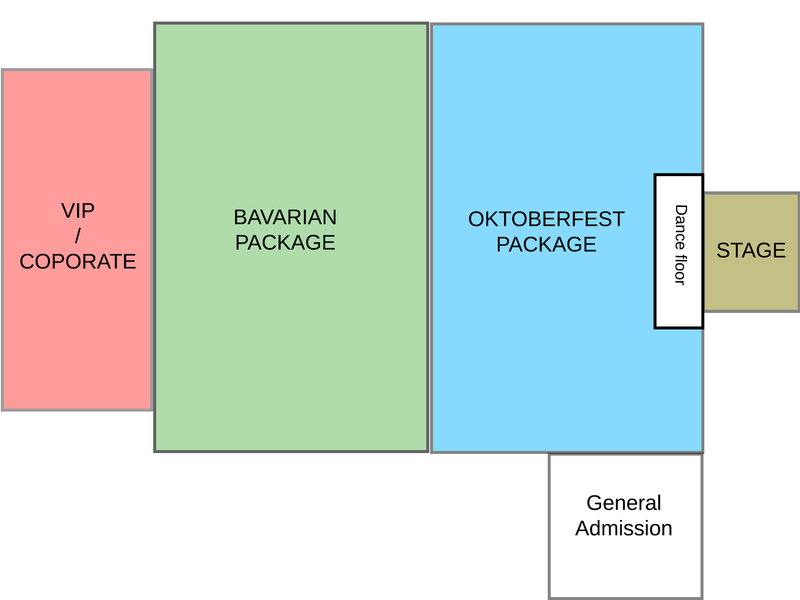 That means the earlier you book the better seated you get at the Edinburgh Oktoberfest. If you decide to book more seats please remember to book them all with the same name, so that you can seat together. Booked seats must be taken within 2 hours after opening. If you want to come later and be sure of your seats book one of our VIP seats (reserved for 4 hours).